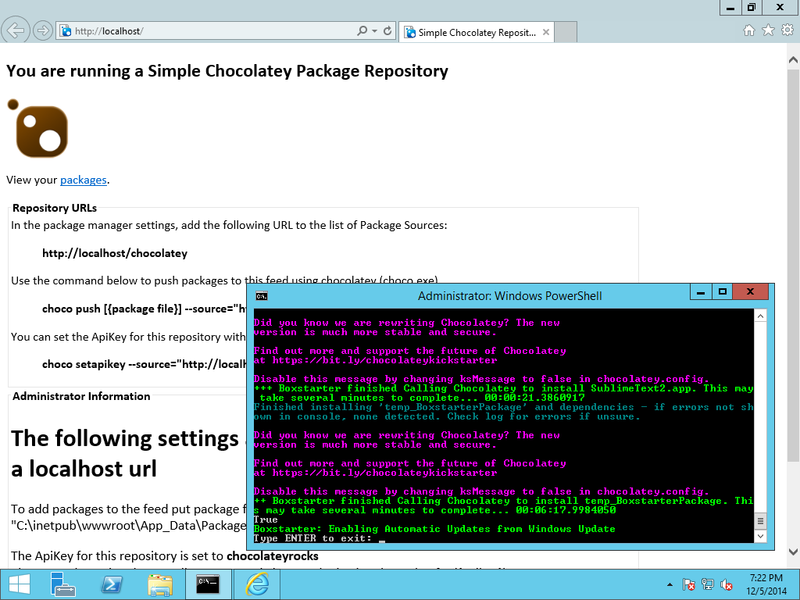 Also, I need to give credit to itToby for his article Setup Your Own Chocoloatey/NuGet Repository. It was a huge help in getting a jump start in understanding what was going on under the hood with the NuGet Server setup after seeing the demo at Code Camp. 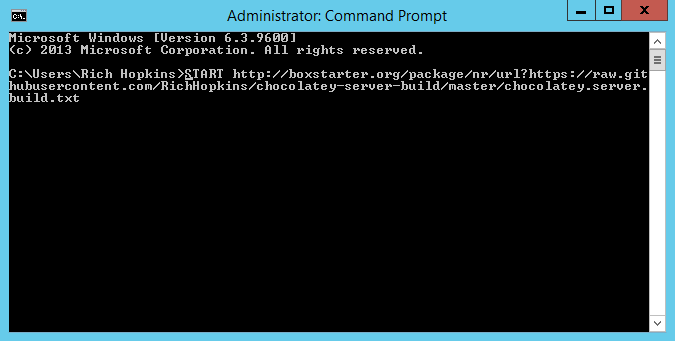 I used that walk-through when I built my first server, but then I kept thinking back to the demo and felt it was much easier… Thats when I remembered the Chocolatey.Server package that Justin used and figured I could Boxstarter the whole thing. Click through a few Boxstarter prompts and kick back. Its that easy! 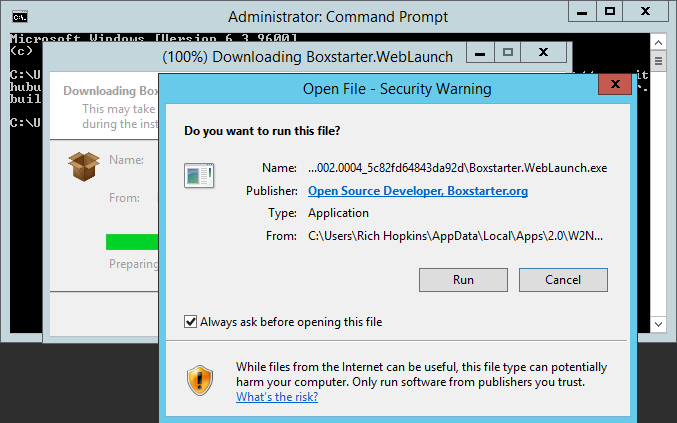 Next post… re-working the Chocolatey and Boxstarter installers and packaging them on your own repository for a fully internal build setup. This entry was posted in DevOps, Enterprise Management and tagged Boxstarter, Chocolatey, Chocolatey.Server, DevOps, IIS, NuGet, PowerShell, SoCal Code Camp. Bookmark the permalink. Excellent tip, I was going to make the same comment before I saw yours. I forked the original gist and commented out some sections I didn’t need, at some point I may try to push it as a package that acts as a “wrapper” around the base Chocolatey.Server on Chocolatey.org so it requires less effort from a user who just wants a simple Nuget feed without having to know anything about IIS. 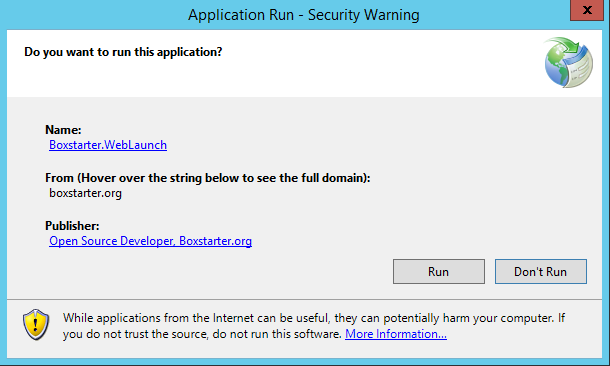 This also was having issues for me on IIS 7.5 and higher (Server 2012/R2) so I updated the Gist with some alternative options that are valid for the newer IIS and ensure that the permissions from the Chocolatey wiki step 3 are properly applied as well so you can push to the server remotely and not just copy files to the directory on the server itself to deploy.